The PERFECT Low Carb Pie Crust — Your New Favorite Recipe! 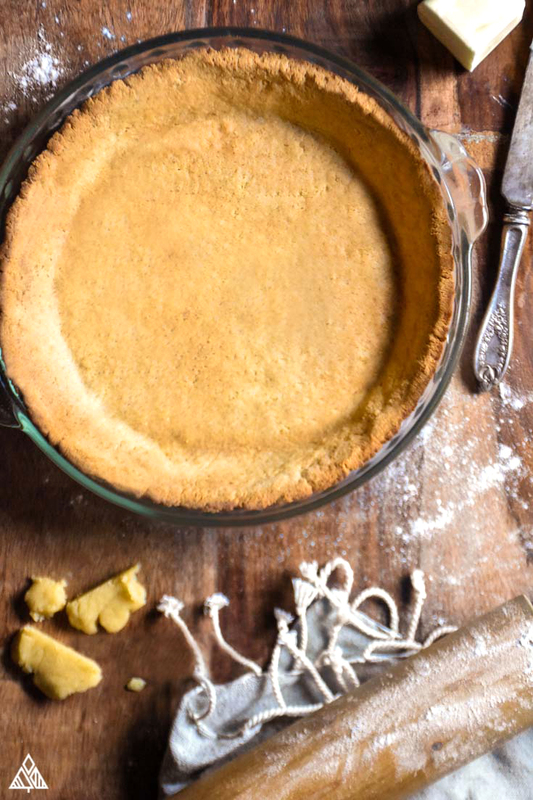 Holy cow, am I excited to share this low carb pie crust recipe with you! Because pie crusts are the foundation of all the best comfort foods— from pies, to pot pies to quiches— And who wants to say good-bye to those delicious classics?! Not you. No me. Why would we? With low carb recipes like this, you can still eat all your favorite foods—without the carbs. I know what you’re thinking. So let me assure you—at The Little Pine, low carb doesn’t mean cardboard-like, eggy, dry, or bland. It means family tested and approved, make your Mama proud, buttery, crumble-free, deliciousness sure to spark a little joy at your next family gathering. Below we’ll share all the tips and tricks you need for low carb pie crust perfection. So come on friends, let’s get baking! 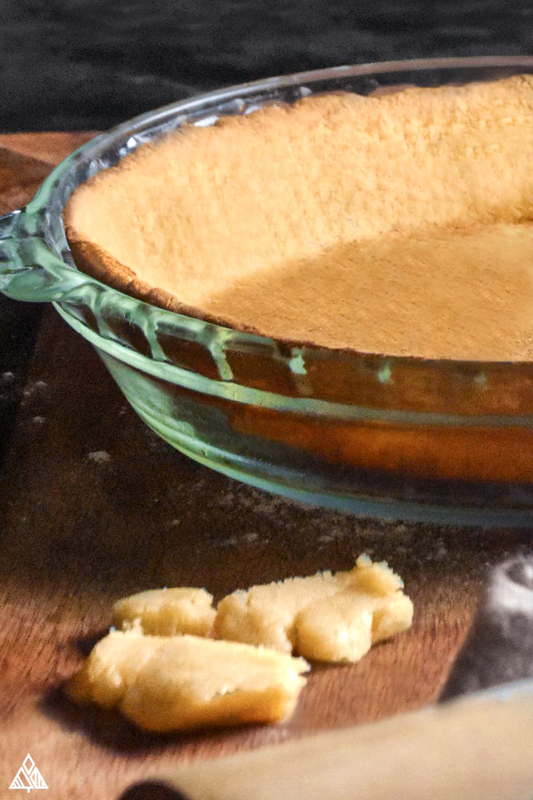 First things first, if you’ve ever made a truly tasty pie crust from scratch, wheat flour or not, you know, and every baker will agree: Pie crusts are seriously hard to get right. Oh ya, I went through all of that, until I got here. I’ve tried SO many low carb pie crust recipes—most of which crumbled with one wrong move (lesson learned: if the recipe doesn’t show a photo of a sliced crust, the recipe is not to be trusted). I then turned to the food science master Alton Brown— who explains how the ingredients interact and what is needed for what. And thanks to him, finally, I came up with this recipe. Pie crust is typically made with flour, butter, water, salt, and sometimes sugar. Obviously, with a classic pie crust, you shouldn’t expect to avoid carbs— to give you an idea, ¼ cup of white flour has 109 calories and 22.8 grams of carbs! But, one thing (from a food science perspective) wheat flour has going for it that low carb flours don’t is gluten. I know, I know, I said the evil word. Don’t hate me. Gluten acts as a natural binding agent— which is why gluten free flours (used in low carb recipes) are dry and lack the “fluffiness” we all love and crave. Ergo, when using low carb flours, something needs to be added to bind all that deliciousness together. It’s a fact: low carb flours don’t have the same elasticity as white or wheat flour. But don’t worry, I’ve got just the trick to make a perfect, stay together, low carb pie crust alternative: psyllium husk. Psyllium husk is super useful in low carb baking— think of it as the glue that holds low carb flours together. It’s higher in carbs than other items on your low carb shopping list, however a little of this stuff goes a long way, fibrous way: 2 tbsp 35 calories, 0 grams of fat, 8 grams of carbs, 7 grams of fiber. 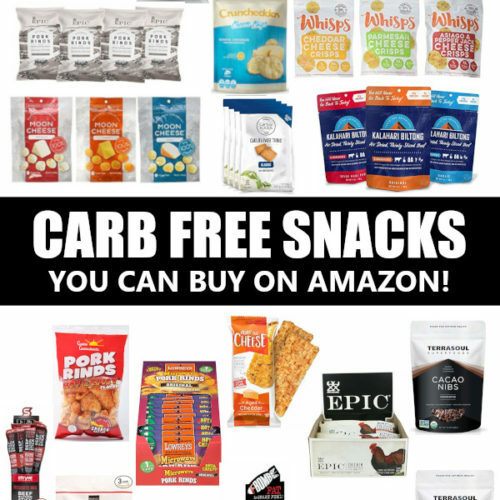 As you can see, it’s a great source of soluble fiber, which is not only awesome for those of you watching your net carbs, but also for how it reacts when it comes in contact with liquid. The fiber absorbs moisture and becomes gelatinous. Combine a little of this with low carb flour, and you’re set! My go to low carb flours are: Coconut Flour, Almond Flour, Almond Meal, Flaxseed Meal, Sunflower Seed Meal, Hazelnut Meal, and Pecan Meal. Each of these flours have their own characteristics that make them special and/or difficult—one thing they do have in common is none of them can simply replace regular flour without adjustments. 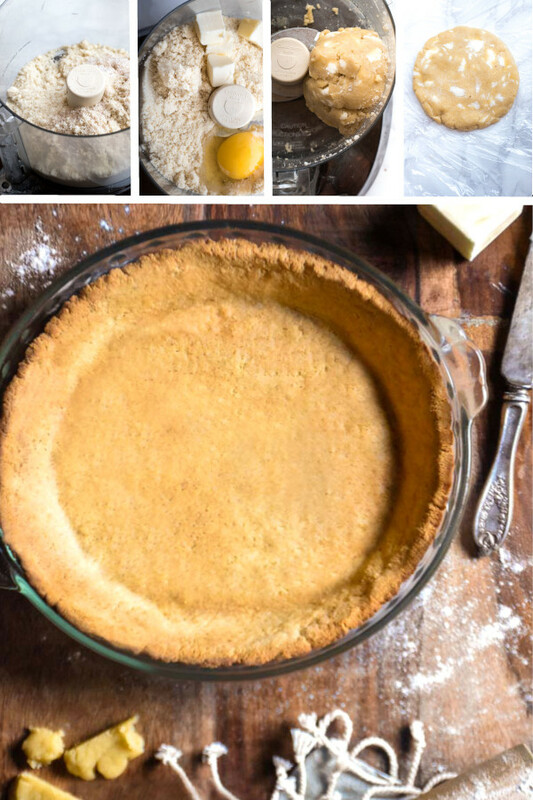 For example, coconut flour pie crust no eggs would be a difficult combo to create as coconut flour is extremely dry and needs more moisture to keep it all together—so low carb pie crust coconut flour recipes are typically loaded with eggs. This recipe in particular is made with my favorite low carb flour: almond flour. This pie crust has the beautiful look and color thanks to the almond flour. Almond meal will work from a taste and structural standpoint as they’re basically the same ingredient, except one minor difference: almond meal contains the skin of the almonds—which will result in a brown speckled crust. Basically, people will know it’s healthy. I like to trick ‘em. Almond flour is essential in low carb baking. 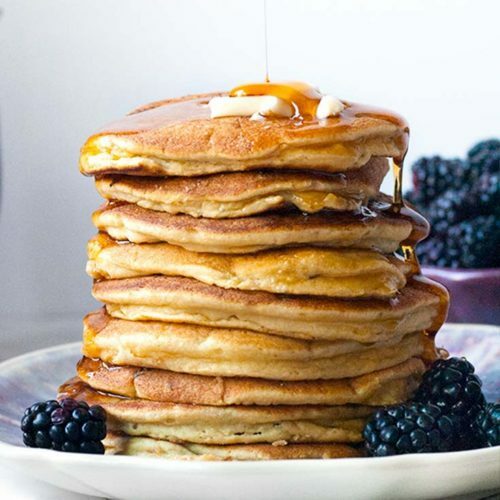 It’s lower in carbs than coconut flour (and obviously wheat flours). It’s gluten free and works well in baked goods, both sweet and savory. Making almond flour is one of the easiest things you can do—all you need are some raw almonds, sans skin, and a blender or food processor. Ta-dah! You’ll be teaching your friends how to make almond flour in no time. Check out the macros of this rock star flour alternative: 170 cals, 15g fat, 6g protein, 6g carbs. 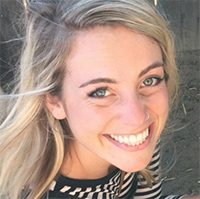 The greatness of almond flour nutrition doesn’t stop there—almonds and their healthy fats (primarily mono-saturated) help to reduce your LDL, or bad cholesterol. 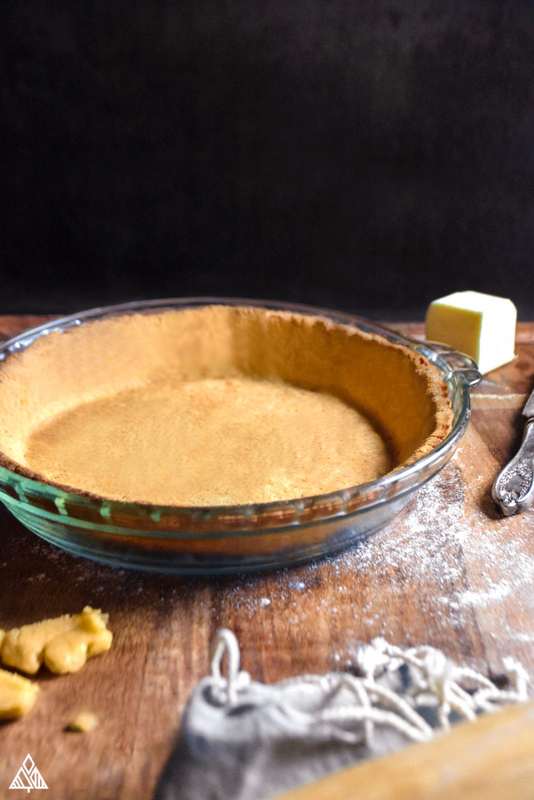 If you’ve made pie crust from scratch before, you know this is the crucial step to making a buttery, flakey, delicious crust: keep your butter cold! And not just in the beginning, throughout every step of the way. This is because you want to keep you butter completely solid until you’re actually baking the crust—which is difficult because butter melts at a very low temperature (below body temperature)— meaning there isn’t a ton of workable range! So, we start with cold butter, make an effort not to process the dough any more than we have to, and place the dough back in the fridge between steps. Many bakers consider lard to be the best fat for pie crusts. I still stand behind butter. I prefer the taste when compared to other fats, plus it’s at every grocery store— whereas lard can be hard to find. Why Use a Food Processor? 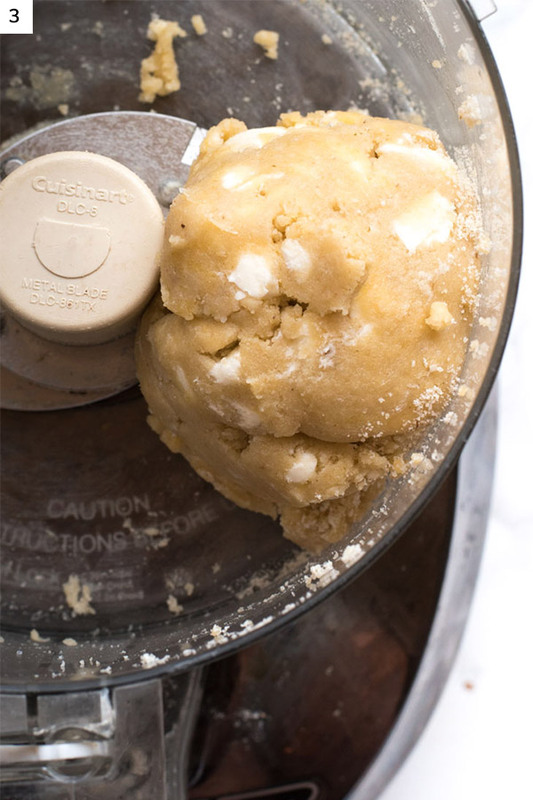 Using a food processor allows you to work the dough only as much as you need to cut the butter into the flour. This helps to prevent the butter from getting too warm, keeping it closer to its solid state. You can also use a stand up mixer or pastry cutter to work the dough together. Alright my friends, let’s get to baking some low carb pie crust! Hope you enjoy as much as I do J Check out below the recipe for some ideas on how to use this crust—from sweet to savory! 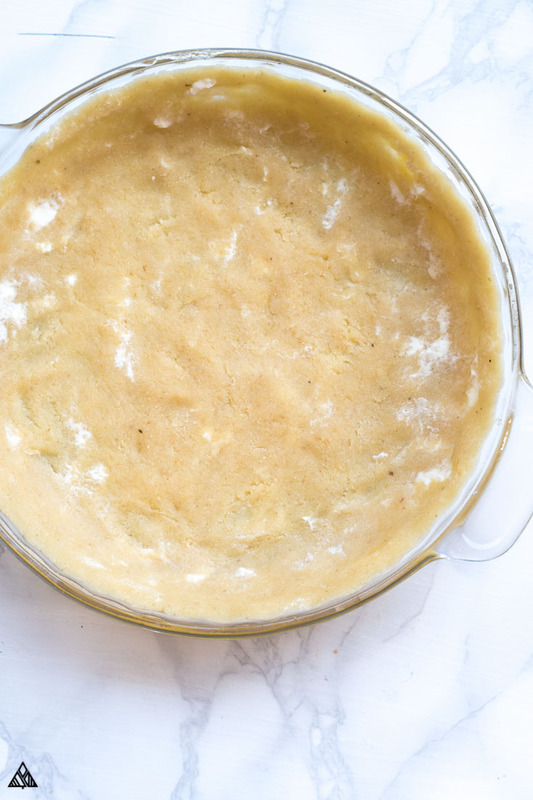 Bring some low carb love to your next family gathering with this low carb pie crust recipe—full of buttery deliciousness with an almond flour base that's totally crumble-free—sure to make your Grandma proud! 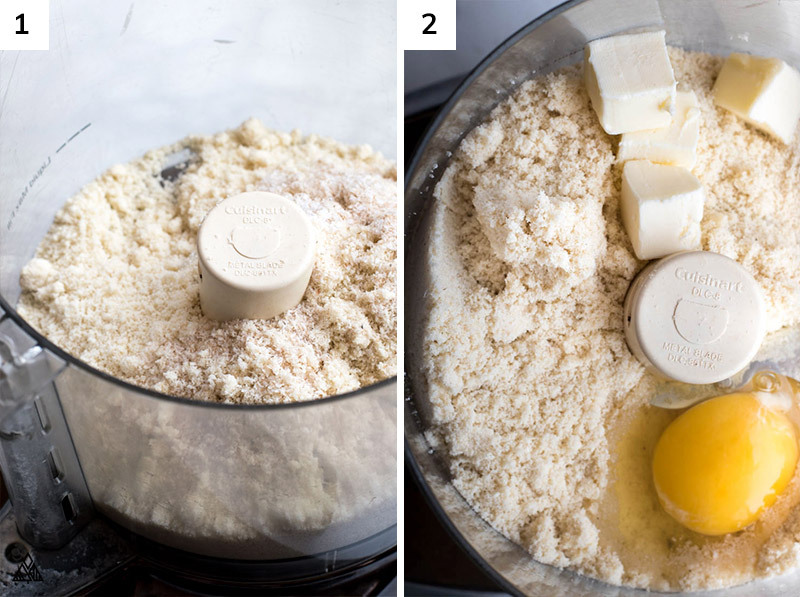 Place all dry ingredients in a food processor, and process a few times to combine. Add the eggs and butter. Pulse only until the dough has combined into a ball. 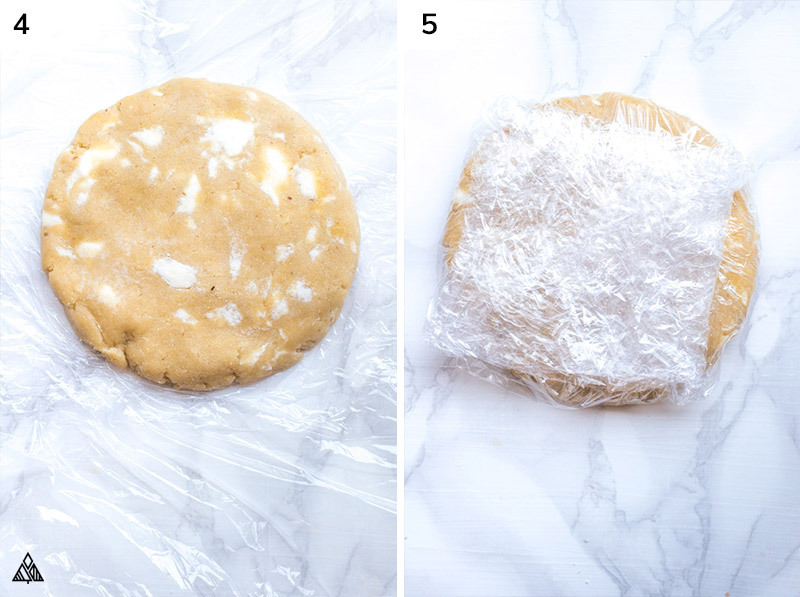 Form the dough into a ball and flatten it out to form a disc. Press dough into a buttered pie pan and prick with a fork several times. Low carb desserts are where you can really get creative—from low carb pumpkin pie to low carb tarts, to low carb pecan pie— anything that pretty little mind of yours can think of. Add a little sweeteners and some cinnamon and this crust tastes just like a low carb graham cracker pie crust— perfect for your next low carb crust for cheesecake. This is the ultimate low carb pie crust for quiche—trust me—in my house we can’t start the day without it! Low carb quiche is the ultimate low carb casserole for breakfast, lunch, or dinner. For the ultimate comfort food dish, check out our low carb chicken pot pie recipe. You’ll need a double batch of pie crust, and you’ll only want to cook one crust before adding the filling. But danggggg—this one’s a keeper! So happy to have found this recipe! 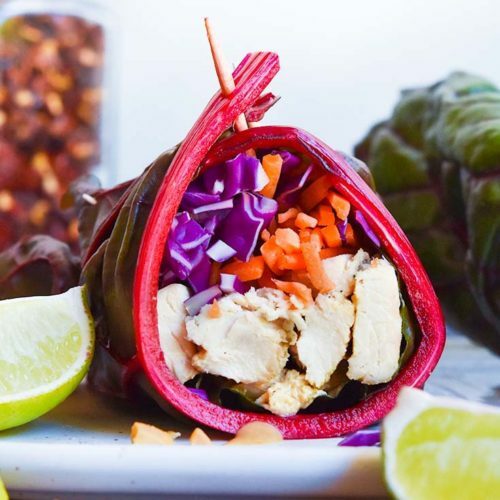 Looks amazing and thank you for the low carb version! Hi Kasey!! I hope you enjoy this recipe as much as I do! 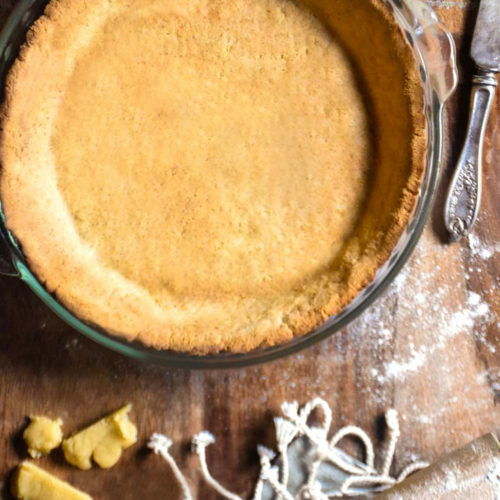 Pie crust is something we should never have to live without right?! I have a huge container of psyllium husk so this will be perfect use for it. Your crust looks amazing!